Organize a Coat Drive. Before being resettled, many refugees have never owned a warm coat, having lived only in warm climates. Each spring, our daughter organized a coat drive at her school. Each spring, her classmates and their parents had a greater understanding of why coats were needed and Seki’s donation box filled up faster. Raise Funds for Peacebuilding. Encourage friends, family, colleagues—anyone who may be(come) interested in Burma and/or refugees—to buy Forced to Flee. 100% of the royalties from the sale of the book will be donated to peacebuilding efforts in Burma. To stir up interest, share links to Forced to Flee’s successful Kickstarter campaign (see below), media coverage of the book under “The Book” on this site, and/or http://25storiesforpeace.wordpress.com/2014/08/14/story3/ To order, simply click on “Click here to Order the Book” icon on any page of this website. Set Up a Screening. Identify a venue for screening a documentary about Burma that draws human rights advocates. Keep in mind filmmakers typically are more eager than their distributors to get their films into the public eye, so contact them directly with a guarantee of media coverage—key to a waived screening fee. Invite a local refugee community leader to speak about issues raised by the film. To learn about new films, simply search the internet. With the easing of media censorship in Burma, activists launched a film festival dedicated to human rights. See www.hrhdiff.org/about-us – and “Like” their Facebook page. Facilitate a Visual Storytelling Workshop. If you have earned the trust of refugees in your community and would like to offer to help increase awareness of their challenges and aspirations, feel free to use the two PDFs below. The flier is, as an example, designed for refugees from Burma. However it could be customized to any ethnic group. The facilitator guidelines conclude with an invitation to submit the most powerful visual stories created in your workshop for possible inclusion in an exhibit and/or a printed or online publication. 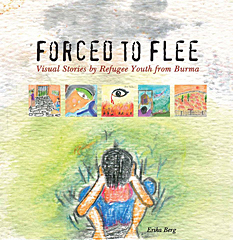 Note: If you have ordered a copy of Forced to Flee: Visual Stories by Refugee Youth from Burma, please see the second appendix, “The Workshops,” for a discussion of the philosophy behind our visual storytelling workshops. Finally, Don’t Give Up. Hopefully, at least one story in Forced to Flee or on this website has compelled you to act!